Approx Trekking Km :- 20 Kms. Adorned with ravishing beauty of falling snow and fringed with pine trees, The Kedarkantha Trek is one of the most sought after snow trekking destinations in India. With falling winter snow it’s a mesmerizing pictorial view and what’s more attractive, is the view of the Mighty Himalayas from the trails right to the top. Nestled at a height of 3810 meters which is about 12,500 feet this is an ideal trekking trail which covers a consolidated distance of 20 kms. The distance is not much and the trekking trail is neither very difficult which enables even the first time trekkers to set on the adventure and enjoy the beauty of nature at its best. With charming and captivating sights of snow clapped Himalayas, the verdant greenery, lush landscapes, myriad collection of flora, frozen ponds, to the sights of mesmerizing peaks, this trek have all the delightful marvels that a trekker wish to experience and view in his journey. Not only for the adventure seekers and trekkers, to enjoy thrilling challenges, The Kedar Kantha Trek is an ideal destination for the nature lovers to bask in the beauty of undisturbed nature and enjoy delightful and blissful moments with exhilarating experiences. Based in Western Garhwal in the Uttarakashi district, the Kedarkantha trek is known for being one of the easy treks of the country which can be attended by people who are in experienced trekkers and have no knowledge of prior trekking. However physical fitness is required where one should be able to jog at least for 4 kms in 30 minutes before committing for the trekking tour. As the altitude rises the air becomes thin and people needs to carry backpacks too, which can all be very difficult, without proper physical fitness. 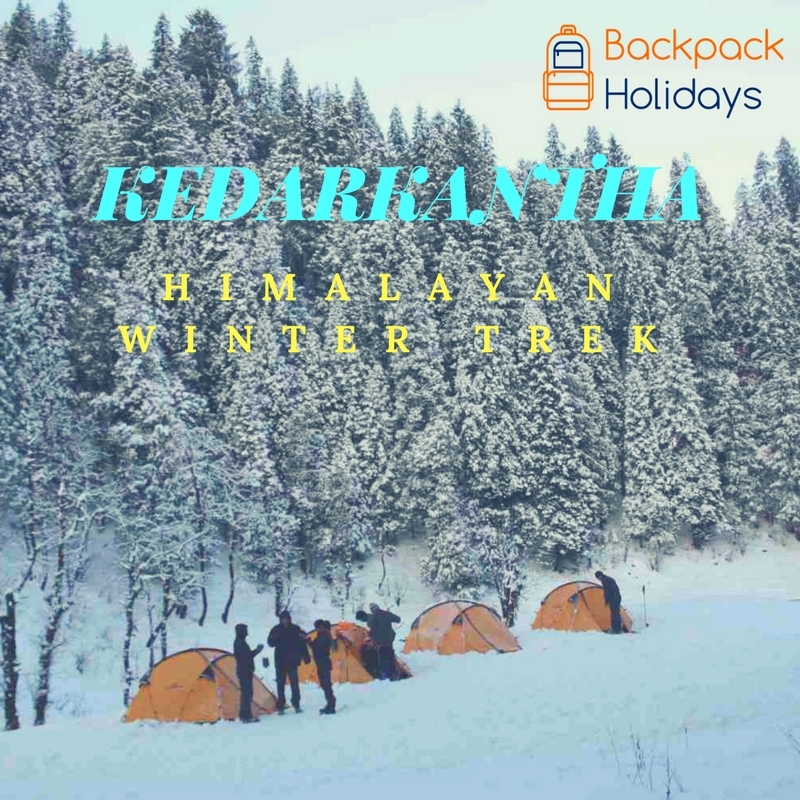 Though Kedarkantha Trek can be conducted almost the whole year but the aspiring views that it provides in the winter months from December to April cannot be compared with summer times. The snow clapped trekking trails and the buckets of snow at the base of the pine trees are a fascinating beauty to savor and which remains only available during the winter days. In fact for the locals the winter months are a time for rejoice and they enjoy with a number of festivals during this time. However it is better to avoid the monsoon time for trekking in these trail. Drive from Dehradun to Sankri (6450 ft, 10 hrs):- We will arrange the transport and they will meet you at Dehradun railway station to pick you for long but scenic drive Sankri via Mussoorie, Barkot, Purola, Mori, Netwar along the Tons River. On arrival set out camp for overnight stay. Trek from Sankri to Juda Ka Talab (9000 ft, 4 hrs):- After morning exercise we will have our breakfast and start the trek around 8 AM for our next camp Juda Ka Talab. We will camp beside the small pond surrounded by Pine and Oak trees. One can have beautiful views of snow clad peaks from Juda Ka Talab campsite. Trek from Juda Ka Talab to Kedarkantha Base (9000 ft, 7 hrs):- Get up early morning to see the golden glow of snow clad peaks. Post breakfast start the trek to Kedarkantha Peak base which takes around 4 hrs to reach Kedarkantha Peak base. Enjoy hot lunch and explore the area. Trek from Kedarkantha Base to Kedarkantha Peak and back to Kedarkantha Base:- Today is a long day trek up to the summit of Kedarkantha peak, have your lunch with amazing views of snow clad peaks of Yamunotri and Gangotri ranges. After spending some quality time at the peak we trek back to nearby camping site at the Kedarkantha Base. Trek from Kedarkantha Base to Sankri (9000 ft, 8 hrs):- Trek down from Kedarkantha Base to Sankri via Hargaon on well marked trail by stones. Trek down through thick forest of Pine and Maple trees and at some places you will have open views of beautiful Har Ki Dun valley. Drive back to Dehradun to catch your train to Delhi with kaleidoscopic memories of the Kedarkantha Trek. Backpack Holidays expects you to carry your personal luggage on your own, if you don’t want to carry your backpack so you can give it to porter, but you have to inform us in advance and have to pay Rs. 350/- extra per day per bag. *Travel Insurance (up to Rs. 2,00,000/-) is available @ Rs. 350 per trekker for the whole trek duration. For Travel Insurance, booking must be made at least two weeks prior to the departure date. Thanks a lot for sharing the information. I really want to go for a trekking.It is adventurous. But it would be fun. I am sure. I have heard about kedarkantha. But I never visited there.You have provided some useful information here. It would be useful to many people who want to do trekking. Keep it up your good job. And keep on sharing new posts.